Dwarf planets are worlds that are too small to be considered full-fledged planets, but too large to fall into smaller categories. In recent years, there’s been a lot of hubbub about Pluto losing its status as one of the planets of the solar system. Pluto is no longer considered the ninth planet in the series of major planetary objects, but instead is now just one of the many so-called “dwarf planets.” The debate started anew after the New Horizons mission passed by Pluto in 2015, revealing a world of surprising geological complexity. As of 2017, delegates from the mission are trying to get Pluto’s planethood status back. Astronomers estimate that there could be as many as 200 dwarf planets in the solar system and the Kuiper Belt. But the differences between planets and dwarf planets may not be obvious at first. The International Astronomical Union defines a planet as being in orbit around the sun, has enough gravity to pull its mass into a rounded shape (hydrostatic equilibrium), and has cleared its orbit of other, smaller objects. This last criterion is the point at which planets and dwarf planets differ. A planet’s gravity either attracts or pushes away the smaller bodies that would otherwise intersect its orbit; the gravity of a dwarf planet is not sufficient to make this happen. Meet the dwarf planets of our solar system, Pluto Eris, Haumea, Makemake and Ceres. Credit: Karl Tate, SPACE.com contributor. As of 2014, the IAU recognizes five named dwarf planets: Ceres, Pluto, Eris, Haumea, and Makemake. But those aren’t the only ones. Other solar system bodies that are possibly dwarf planets include Sedna and Quaoar, small worlds far beyond Pluto’s orbit, and 2012 VP113, an object that is thought to have one of the most distant orbits found beyond the known edge of our solar system. The object DeeDee could also be a dwarf planet, according to observations made in 2017. According to NASA, scientists think that there may be more than a hundred dwarf planets awaiting discovery. However, the debate over the status of dwarf planets, particularly Pluto, remains a hot topic. The primary concern stems from the requirement for a planet to clear out its local neighborhood. Is a dwarf planet a separate entity from a planet, or simply another classification? The question may not be settled in the near future. Ceres is the earliest known and smallest of the current category of dwarf planets. Sicilian astronomer Giuseppe Piazzi discovered Ceres in 1801 based on the prediction that the gap between Mars and Jupiter contained a missing planet. It is only 590 miles (950 km) in diameter and has a mass of just 0.015 percent that of Earth. In fact, Ceres is so small that it is classified as both a dwarf planet and an asteroid, and is often named in scientific literature as one of the largest asteroids in the solar system. Although it makes up approximately a fourth of the mass of the asteroid belt, it is still 14 less massive than Pluto. Unlike its asteroid neighbors, Ceres has a nearly round body. 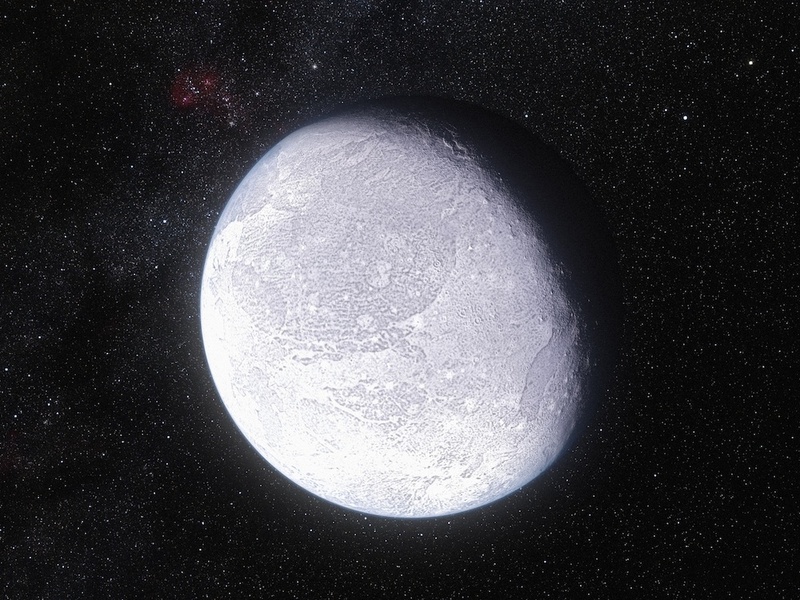 The rocky dwarf planet may have water ice beneath its crust. In 2014, the European Space Agency’s Herschel Space Observatory detected water vapor spewing from two regions on Ceres. Pluto is the most well known of the dwarf planets. Since its discovery in 1930 and until 2006, it had been classified as the ninth planet from the sun. Pluto’s orbit was so erratic, however, that at times it was closer to the sun than the eighth planet, Neptune. In 2006, with the discovery of several other rocky bodies similar in size or larger than Pluto, the IAU decided to re-classify Pluto as a dwarf planet. Despite its small size — 0.2 percent the mass of Earth and only 10 percent the mass of Earth’s moon — Pluto’s gravity is enough to capture five moons of its own. The pairing between Pluto and its largest moon, Charon, is known as a binary system, because both objects are orbiting around a central point that is not within the mass of Pluto. NASA’s New Horizons mission flew by Pluto in 2015 and revealed a wealth of surprises. This included zones that are bereft of craters (indicating the surface is relatively young), mountains that are likely as high as 11,000 feet (3,500 meters), and even haze above the dwarf planet’s surface. When it was first discovered, Eris was thought to be the largest of the dwarf planets, with a mass 27 percent larger than that of Pluto and a diameter of approximately 1,400 to 1,500 miles (2,300 to 2,400 km). It was the discovery of Eris that prompted the IAU to reconsider the definition of a planet. Further observation went on to suggest that the dwarf planet is slightly smaller than Pluto. The orbit of Eris is very erratic, crossing that of Pluto and nearly intersecting the orbit of Neptune, but is still more than three times larger than Pluto’s orbit. It takes 557 years for Eris to orbit the sun. At its farthest point from the sun, a point that is also called its aphelion, Eris and its satellite Dysmonia travel far beyond the Kuiper Belt. The surface of Eris is likely nitrogen and methane-rich, but in a thin (1 millimeter) layer across the surface. Some scientists suggest the surface is the condensed atmosphere of Eris, which expands into gas when the dwarf planet is closer to the sun. Haumea and Makemake are the most recently named dwarf planets in the solar system. Haumea is unique because of its ellipsoid shape, only just meeting the hydrostatic equilibrium criteria for dwarf planet status. The elongated shape of the dwarf planet is due to its rapid rotational spin, not a lack of mass, which is about one-third that of Pluto. The cigar-shaped dwarf planet rotates on its axis every four hours, likely a result of a collision. The odd object also hosts a red spot and a layer of crystalline ice. Finally, Haumea is the only object in the Kuiper belt other than Pluto known to host more than one moon. A moon was discovered around Makemake in 2016, more than a decade after the dwarf planet itself was found. Its diameter is known to be about two-thirds that of Pluto, and the newly found moon will allow for measurements of its mass. Makemake is also of value to the astronomical community, as it is another reason for the reconsideration of the definition of a planet. Its comparable mass and diameter to Pluto would grant it planet status if Pluto wasn’t also stripped of that title. Pluto, Eris, Haumea and Makemake are all known as “plutoids,” unlike the asteroidal dwarf planetoid Ceres. A plutoid is a dwarf planet with an orbit outside that of Neptune. Plutoids are sometimes also referred to as “ice dwarfs” due to their diminutive size and cold surface temperatures. The outer planets show evidence of interaction with plutoids. Triton, the largest moon of Neptune, is likely a captured plutoid, and it is even possible that the odd tilt of Uranus on its axis is due to a collision with a plutoid. Similarly to dwarf planets, there are potentially hundreds of plutoid objects in the solar system that have yet to be given official status.